For more information regarding this event, please email Harvey Brough at fredglover@harveybrough.com . A programme of music concerned with orphans. Movements from Handel’s Foundling Hospital Anthem which he compiled and wrote to raise funds for the Foundling Hospital in London. Rather cheekily, he included the Hallelujah Chorus in the piece, as it had only been heard in Dublin previously. 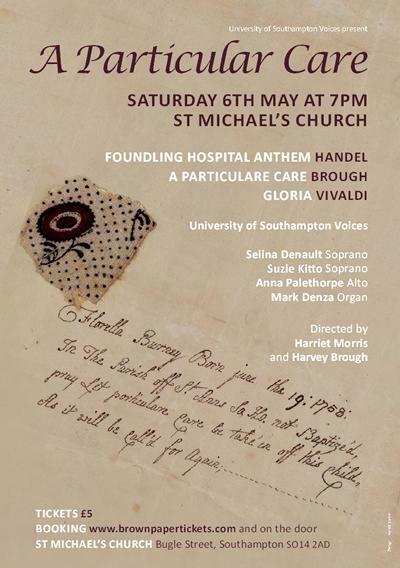 A Particulare Care - a piece by Turner Sims Professor of Music Harvey Brough - a setting of two poems by William Blake and the writing on a token left with foundling Florella Burney, at the Foundling Hospital - "Pray let particulare care be taken of this child as it will be called for again". 98% of the children left at the Hospital were never “called for again”. Vivaldi’s Gloria - written for female foundlings at the Ospedale della Pietà in Venice. Tickets available on the door or in advance on the link above.